How are Studio and Stage Singing Different? The studio feels more like an operating room than a performance space. The recording studio can seem artificial and strange to a veteran live performer, offering very different sensory input for the automatic nervous system to respond to. And the performing voice is primarily worked by the automatic nervous system! There is no substitute for experience. Sing in every studio you possibly can, as often as you can! The more you do it, the less strange it will feel and the more you will be able to relax so your automatic nervous system can play with your imaginary friends. The singer loses focus on where and why to sing. The resulting vocal, even if the voice is hitting all the notes, sounds numb or disconnected. Understand the audience IS there... in your imagination! Take your familiar sensory memories of being onstage into the vocal booth or recording space. Make sure the audience you're imagining is your most supportive, friendly and enthusiastic one. Before each song you record, figure out who the lyric is written to and focus, in front of your audience, on delivering your message to that one heart. Even with a supportive production team, it can feel like you are singing to the critics instead of your fans - and your inner critic can be the hardest one to please! This can divert your voice's attention away from the heart it is supposed to be delivering a message to. Every take will have elements of the question 'was that ok?' in the nuances of the vocal performance. Ignore them! Do this by dimming lights in the vocal booth and maybe the control room, too, positioning at the mic so you're not looking straight into the control area, and leaving your own inner critic out of your recording space while you're actually singing. The singer's hands and arms are usually hanging at 'rib anchor' position. Without the normal mic or instrument to hold, the hands fall lifelessly at the sides, which causes the ribcage to drop and collapse inwards. Even a little ribcage collapse will sabotage breath control because it relaxes the taut stretch of the diaphragm, which then can send uncontrolled breath to the vocal cords. This results in a loss of vocal control. Talk with your hands in such a way that your ribcage opens. One of several ribcage stretching techniques I use is something I call 'studio hands', pressing my fingertips together to stretch the ribs and focus power coming from pelvic floor. Make sure you have enough space in front of you to do this while keeping your mouth at a constant distance from the mic. 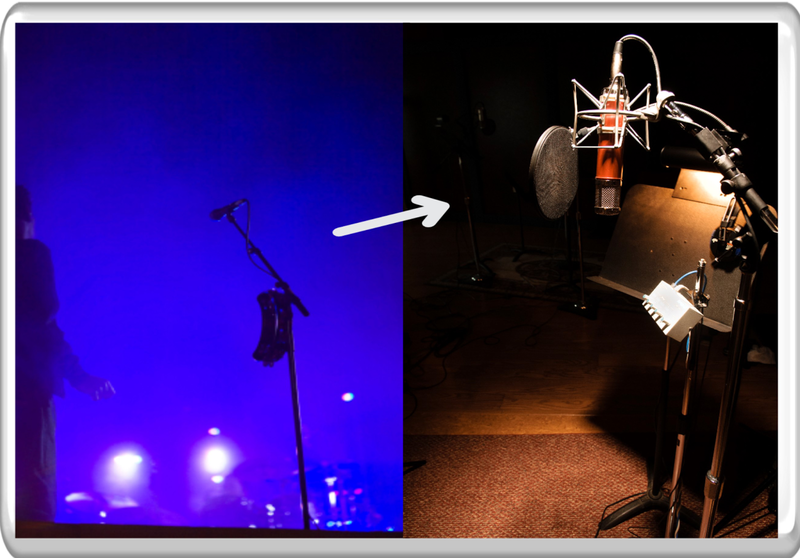 If necessary, ask the engineer to re-position the mic and have the pop filter connected from above. You have studio headphones on your ears. Your ears are hearing the details of your vocal sound under a microscope instead of stage monitors. Live mics are usually much more forgiving, with more reverb and and a smooth, rich ambiance from added room acoustics as well as crowd response. The sound of studio mics, even with reverb in the headphone cue, can throw the ear if it is unfamiliar with all the fine detail they pick up from the voice. The eq is different, too. The result can be a sudden lack of confidence, sabotaging breath support from a guarded stance and also tightening the throat. Ask for more reverb in your cue mix if the sound is too dry. Ground yourself acoustically in your recording space by taking one headphone side halfway off one ear. A good way to practice familiarizing your ear with more detailed hearing is to practice singing with HearFones, an acoustic gadget that actually sounds a lot like a clean mic or even stage in-ear monitors. 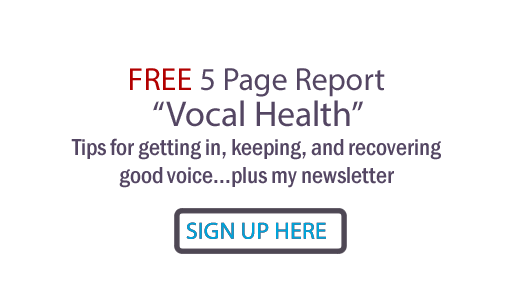 Vocal lessons with a focus on mastering studio singing. The ultimate studio vocal training course 'Singing In The Studio'. Vocal Production - working as part of your production team, I am in the studio with you, producing your vocals.